I love this color! Tooling around on Pinterest, I saw this tribal nail art by Raggio Di Luna and was immediately inspired to try it on My Current Crush. Would it look as good on a texture? I don't know how Raggio di Luna got her pyramids so clean. Maybe she used tape? Maybe she's freakin' amazing. I freehanded them, and they look like lumpy triangles. 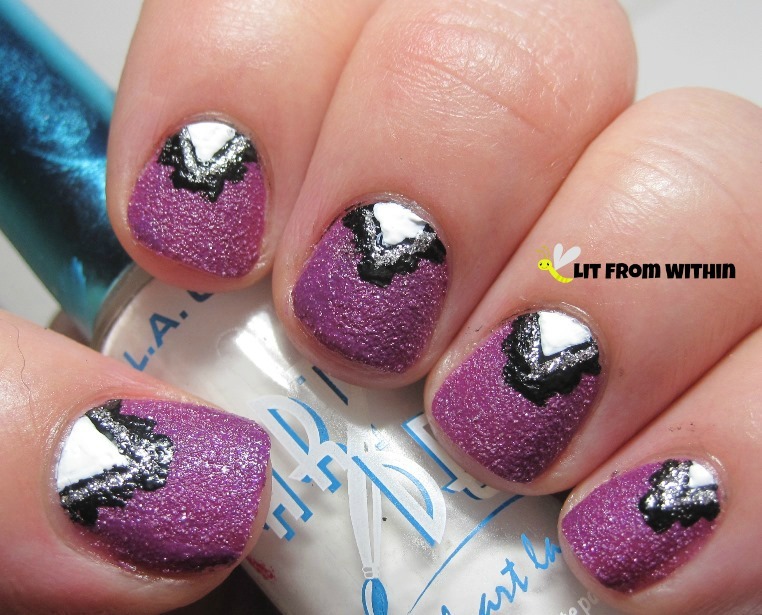 Next, I made the V shape with a silver glitter striper. If you find using stripers to be incredibly awkward, try cutting them down. My favorite ones all have the brush trimmed down - not the length, but the thickness. The white triangle is so tiny on my little nails! I pretty much had to blob the white in there and then clean up the shape with my black striper. No way could I make it that straight. 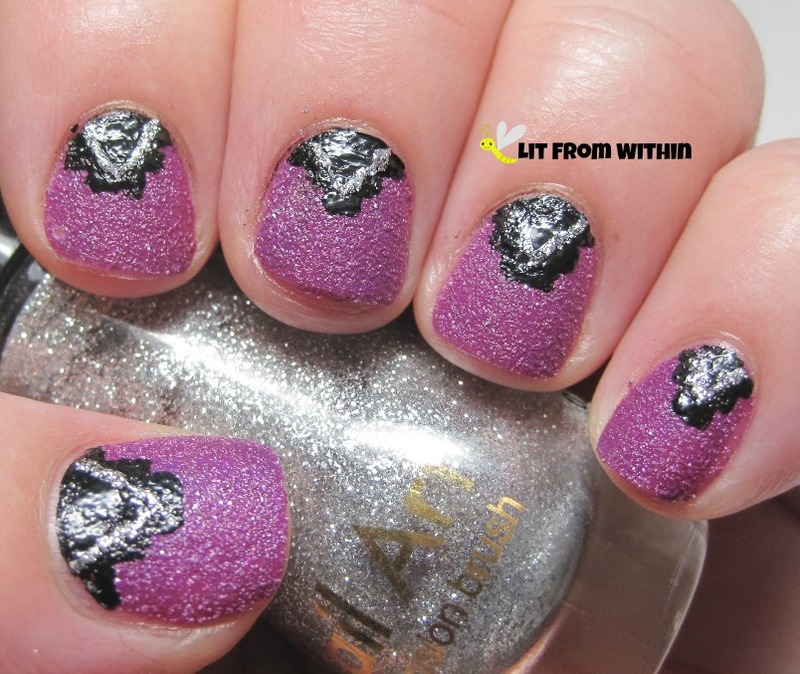 I loved this even more with topcoat! It smoothed out the art, and My Current Crush took on a softer, but still glittery look. I fudged the pyramids on my right hand, but no one could tell. From normal hand-viewing distance, they looked the same. I wore this to a dinner party and impressed the crap out of the people there who actually cared about these things. The guys pretty much looked to their wives to see what the appropriate reaction should be! Which, of course, should be a slow golf clap. 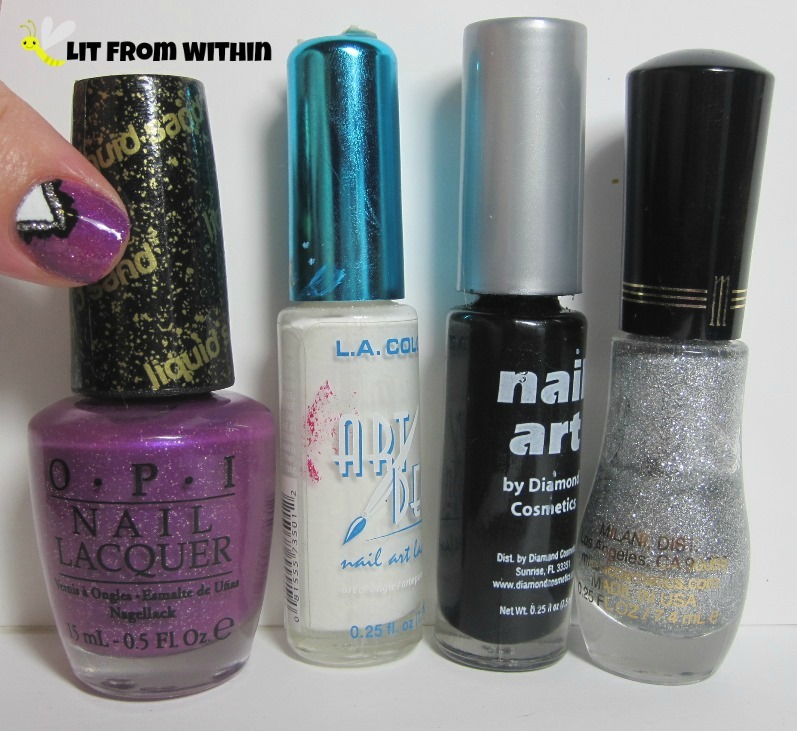 Bottle shot: OPI My Current Crush, nail art stripers in white, black, and silver glitter. 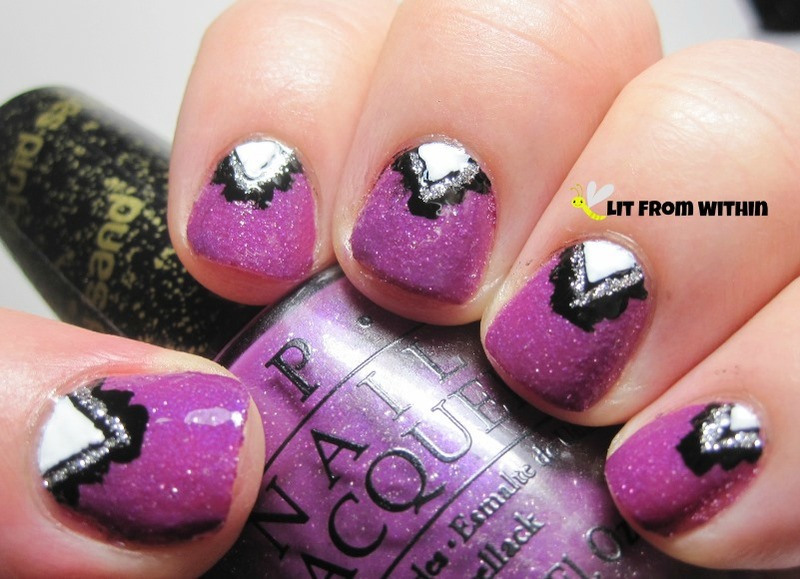 I'm glad I didn't let the pyramid shape intimidate me from trying this nail art because I love how it turned out! Have you ever been inspired by a complicated design, and found a way to make it work for you? Pretty purple texture! Love the simple design on it! Looks simple, but it took me a bit! That pyramid was killer. lol. Probably would have been easier if I'd used topcoat first, and then did the design on a smoother surface. Live and learn! This is the one I mentioned to you on your blog. It's a great red-violet-orchid color. I'm not all in for these type of textures but I like what you did with these! I really like the ones with glitter the best. 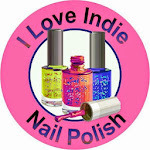 They behave much like an Indie glitter when you topcoat them - smooth, with flashes of light. If I was at the party, I would have been one of those ladies admiring your pretty nails :) Marvelous job! The duo was on clearance for $15, and I went back and forth on getting it... but I'm glad I did. I really love it. That is the best compliment! I'm a blush, really. One of my goals is to make nail art more accessible. Thank you! LOL! A girl after my own sense of humor!! I am dying for that color - great design! Love this! I haven't tried My Current Crush yet but I can't wait to get it on my nails! I hope you'll share a pix, or let me know if you post it on your blog - I wanna see! It's so pretty. How cute! I just bought that OPI! Did you also find it in that duo pack, or was it released on its own? I like that pinky purple! Interesting! I like the base color. I was surprised at how much I ended up liking that color, too. An early favorite for 2014! I'm usually not a fan of the texture polish but I do think it's a beautiful color! I end up picking at the textures, but I do like them. 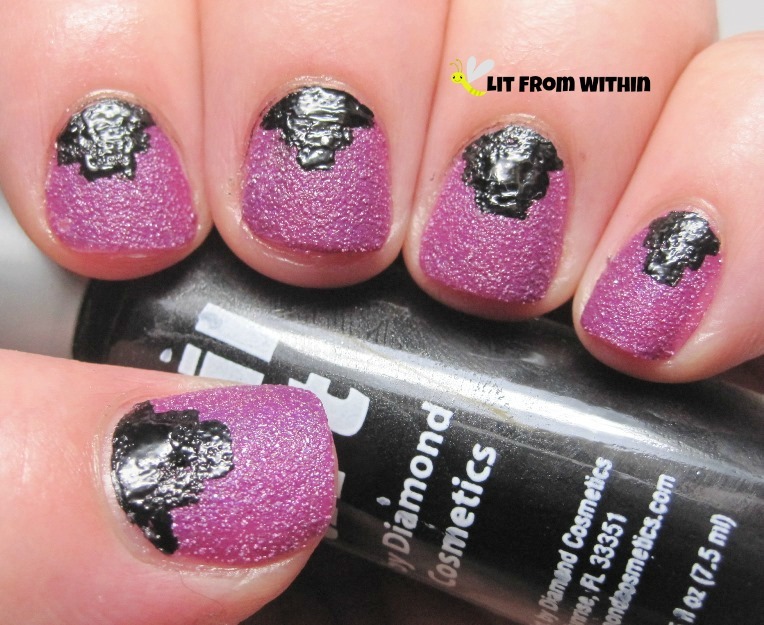 Ones with glitter look awesome with topcoat. Oh cute! Love the textured base for the tribal look! Thanks! It was hard to paint over, though! lol! Not one of my smarter moments. Cute.. but sophisticated, right? lol! thanks so much! I stretched myself a little with this one.